“One person installation, one person removal, and stay dry” is the driving mantra of Pier of d’Nort. Our patented design allows a single fourteen-year-old (or a married one) to install and remove a Pier of d’Nort boat dock with no special tools, winches, vehicles, or skills. There’s something inherently fun about watching something large splash into the water. It brings out the teenager in all of us. 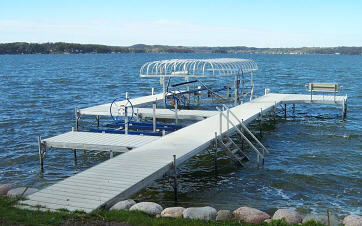 An aluminum pier is a lifetime investment. Why shouldn’t it be the best when the best is affordable? No other boat dock offers the convenience, versatility, beauty, durability, and sheer fun as a Pier of d’Nort docks – at any price! One person installation and removal – guaranteed! Direct sales – why pay for a dealer network? And since we only sell direct, it’s our duty to provide for you the most complete and most accurate information possible, which is what you will find here. We are also available via phone , email, or in person to answer your questions and hopefully give you complete confidence in buying our pier – as we have done for satisfied customers all over the country.